Time out for a brief comparison of church bells. There are bells in various numbers that merely ring to call people to services or mark certain hours of the day. 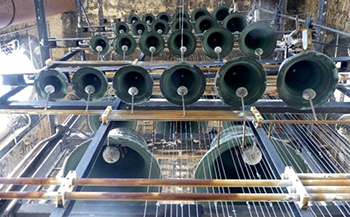 There are larger sets of bells that form a scale or peal that are rung British-style in “changes” or mathematical patterns that can go on for hours until permutations are exhausted. 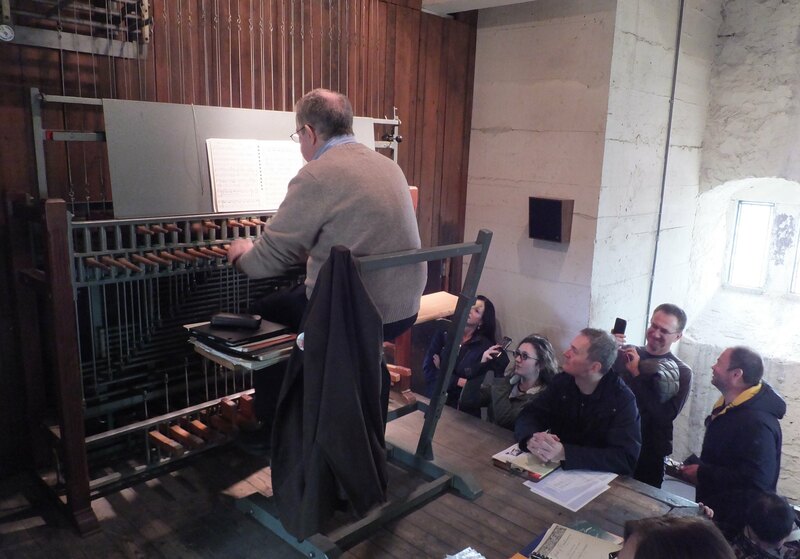 Then there are carillons — collections of 23 or more tuned bells on which trained carillonneurs can play arrangements of all kinds of music. 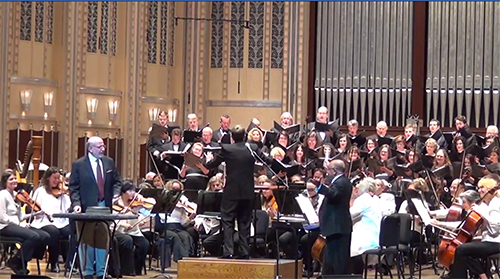 The latter are popular in Belgium and the Netherlands, and there are four in the Cleveland area — two-octave instruments at St. Paul’s in Cleveland Heights and St. Christopher’s in Gates Mills, and the 47-bell, four-octave carillons at the Covenant and the Church of the Savior in Cleveland Heights. Judging by the ancient appearance of the French Gothic Church of the Covenant, George Leggiero assumed the carillon had been there forever. 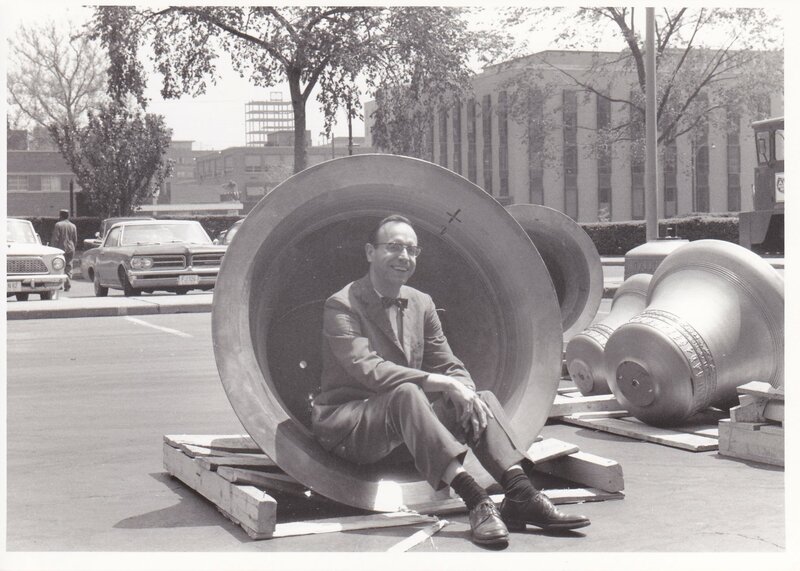 But in fact the 47-bell instrument had only been installed by the Royal Eijsbouts Bell Foundry of Asten, the Netherlands, months before he arrived in Cleveland. 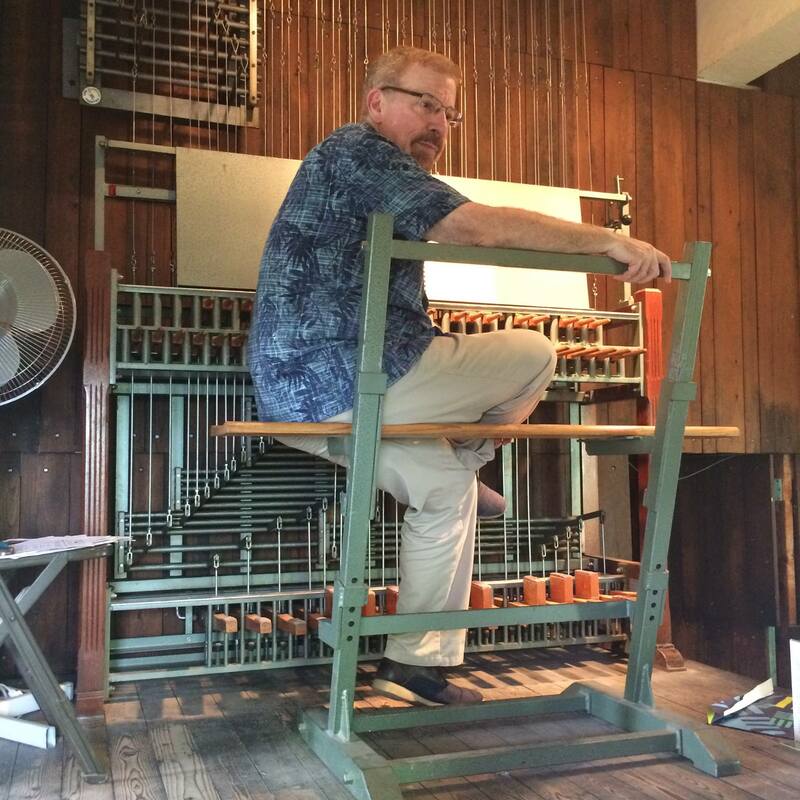 This weekend, the carillonneur and two of his colleagues will celebrate its 50th anniversary in events on Friday, Saturday, and Sunday. 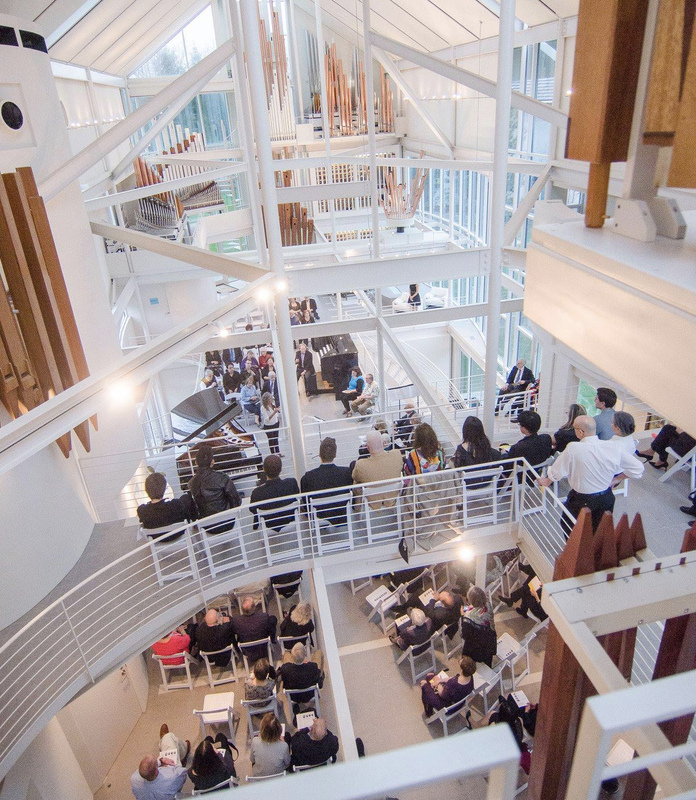 “David Osburn (above) of St. Paul’s Episcopal Church in Cleveland Heights will play the usual Friday noon lunchtime concert, which will include Irish and Scottish music honoring Alexander McGaffin,” Leggiero said. “By coincidence, his grandchild and great grandchild will be in Cleveland for the occasion, and they’ve organized a family reunion.” Leggiero himself will be out of town attending the annual meeting of the Guild of American Carillonneurs in Springfield, Illinois. On Saturday at noon, the restored Cragin Peal, a separate array of three bells hung on yokes and activated by electric motors, will announce the kickoff of Parade the Circle, in which the Church of the Covenant has entered a special float — with the theme of “Bats in the Belfry,” a suggestion by Robin Van Lear, Artistic Director of Community Arts for the Cleveland Museum of Art. “They’re aiming at having 47 bats in all shapes and sizes participate,” Leggiero said. Then on Sunday, the church will mark the anniversary with bell-themed readings and music at its morning service, followed by music from the carillon. The main event will begin at 2:00 pm. 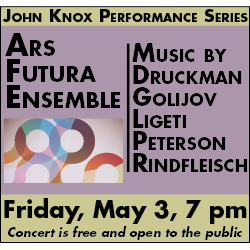 “I’ll give a pre-concert talk at 1:15 pm, then David Osburn and I will join Patrick Macoska, a retired Michigan architect, in a varied concert including music for four fists, followed by a reception,” Leggiero said. One thing Leggiero doesn’t need to worry about is tuning his instrument before he plays, although the metal wires that activate the bell clappers may need some adjustment. 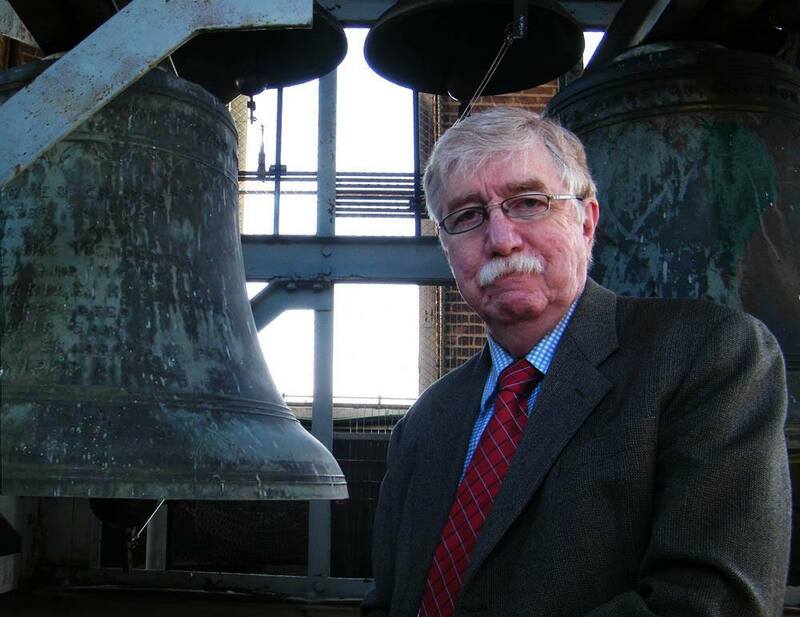 Weather doesn’t seem to affect the pitch of the bells, “but they do sound crisper and brighter in winter and more mellow during humid summers, when their tones also carry farther,” he said. 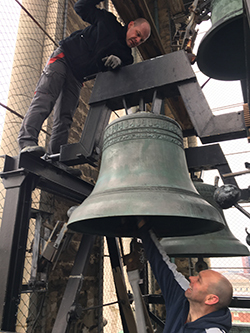 While the Covenant carillon was originally installed by the church, its maintenance and administration is now the responsibility of the Friends of the McGaffin Carillon, a non-profit organization that sees the Tower as a community resource and which paid for the restoration of the peal. 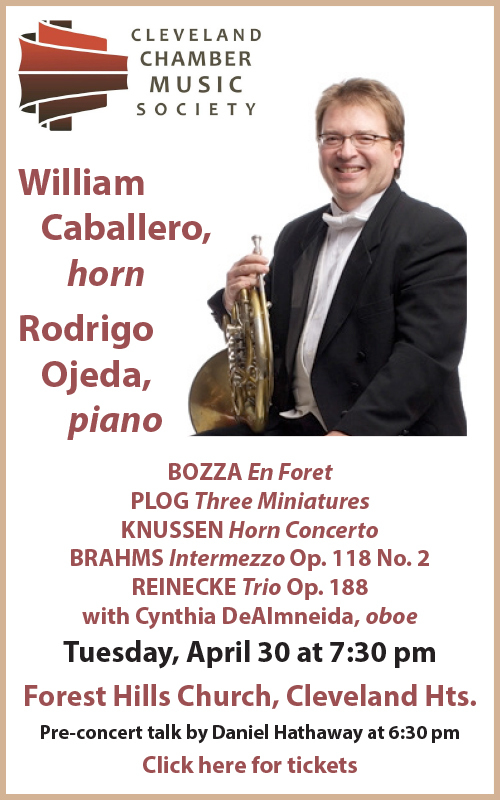 Leggiero hopes that a contract will be signed in the near future to add two bells, renovate the ringing mechanism, and replace both the keyboard and the practice keyboard that allows carillonneurs to rehearse using tone bars, “so we can stay friends with the neighbors,” he said. 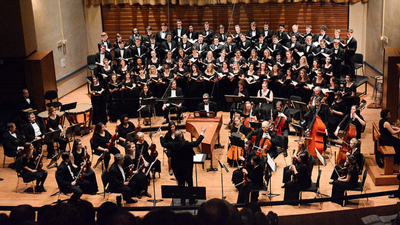 “I’d also like to start a student guild to play the instrument daily,” he added. He has a few students already, and has received an Ohio Arts Council Traditional Artist Grant to support his activities. 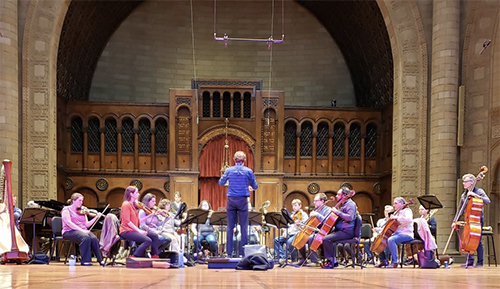 “The people in Columbus were happy to have a new type of instrument to fund.” He’s also looking to involve students from the nearby Cleveland School of the Arts. 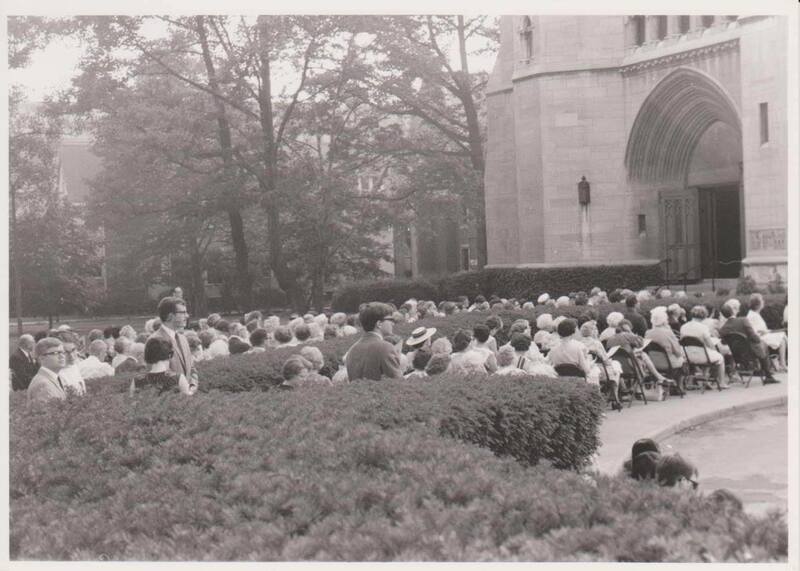 Photos from the 1968 installation and dedication: music director Henry Fusner tries out a bell in the parking lot; the audience on the church lawn at the dedication recital. 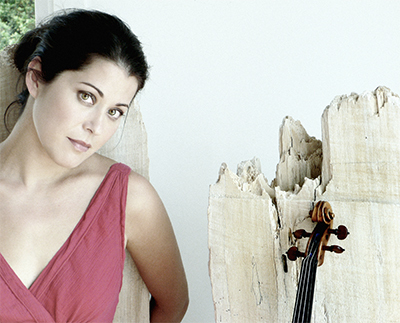 Published on ClevelandClassical.com June 5, 2018.